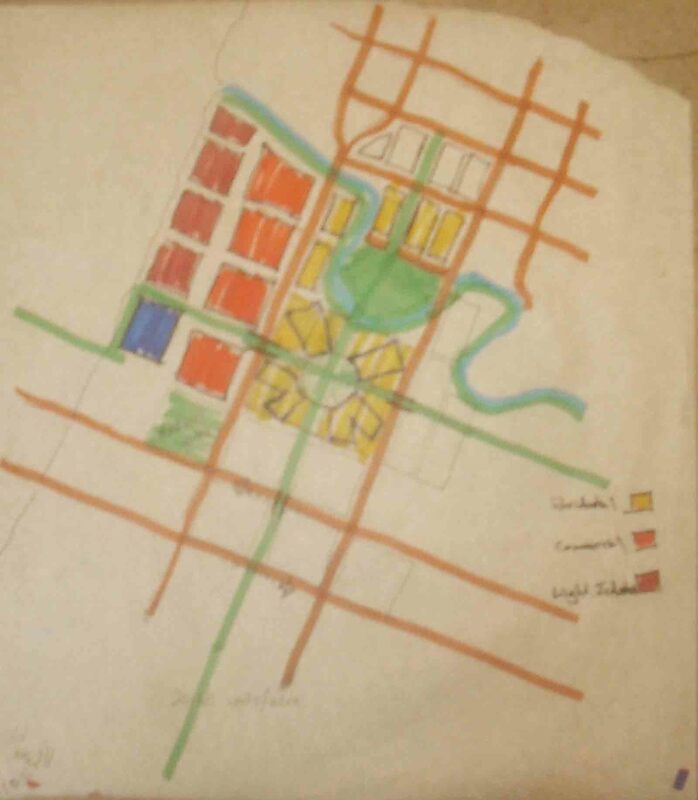 Please visit the sister post to this one to learn about the research that went into the Salem North downtown Redevelopment Project. 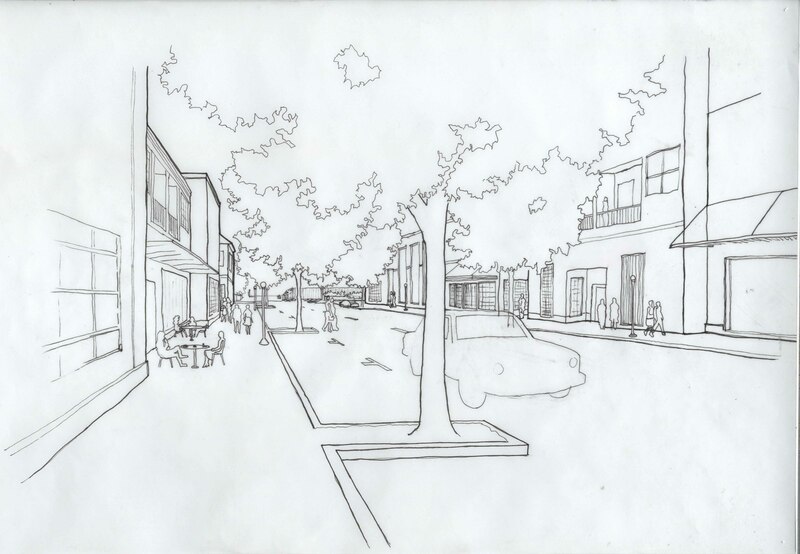 The image above is a 1:100 scale rendering of our proposal for redeveloping the Salem North Downtown Neighborhood. 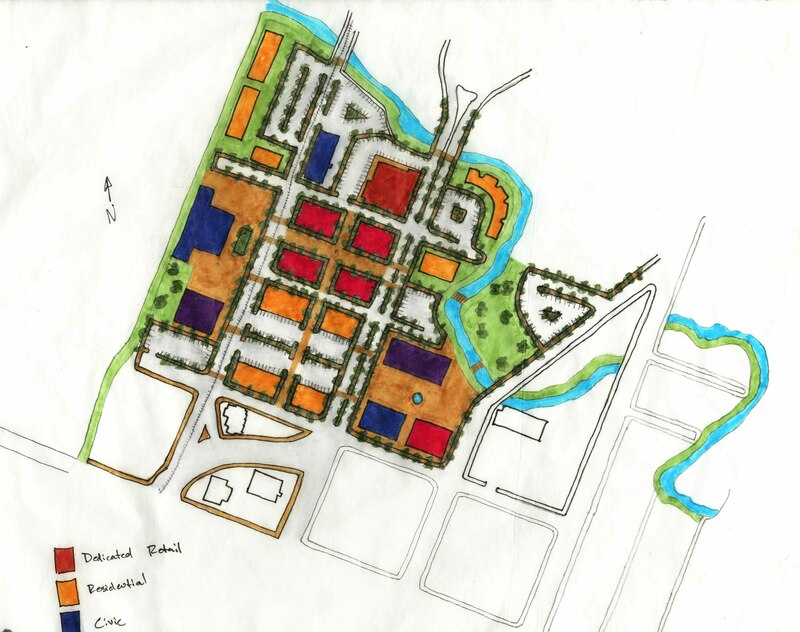 This image is a painstakingly hand-rendered 1/16″=1′ depiction of the proposed axial “Town Center” complex. 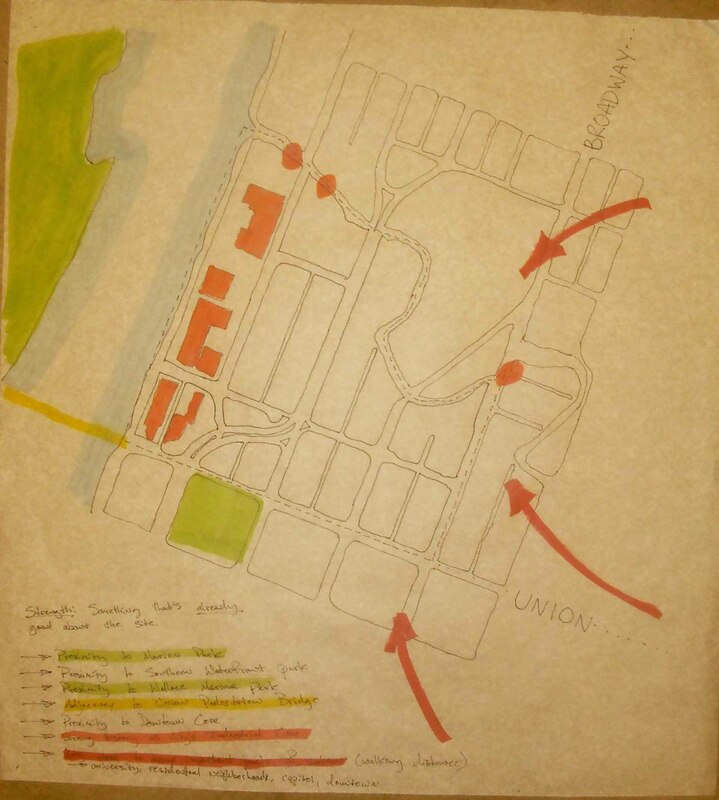 It ran along an East-West axis on the newly renovated Fir street corridor with connecting Mill Creek with Liberty Plaza at the East and the Willamette River with Town Center plaza at the West. 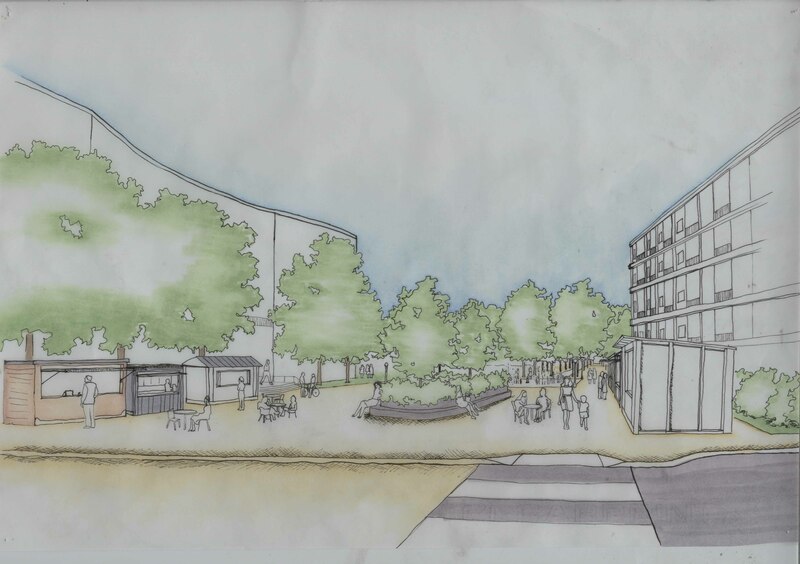 The Salem North Downtown redevelopment proposal also included detailed proposals for major street redesigns. Commercial Street (the major North/South thoroughfare through the neighborhood) is currently 85′ from curb to curb with 3 lanes in either direction. It is stark, bare, has terrible, pedestrian unfriendly sidewalks and limited pedestrian crossings. 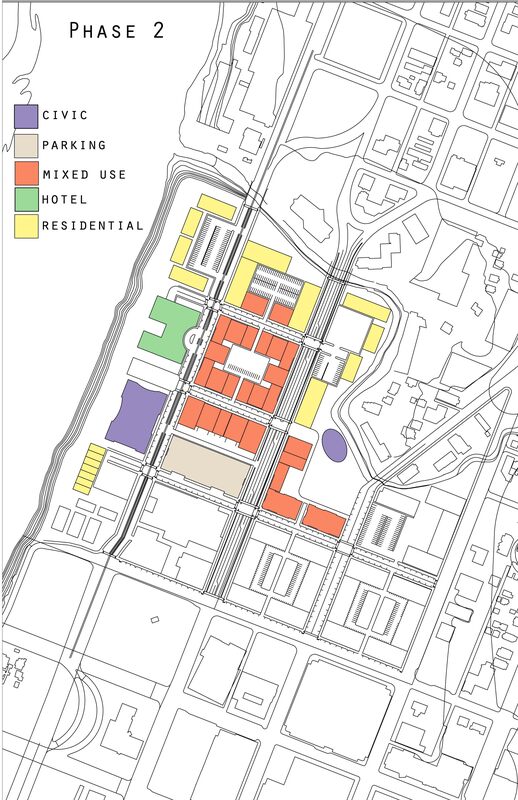 Commercial street is the transportational hub of the neighborhood and is a cornerstone of the redevelopment proposal. 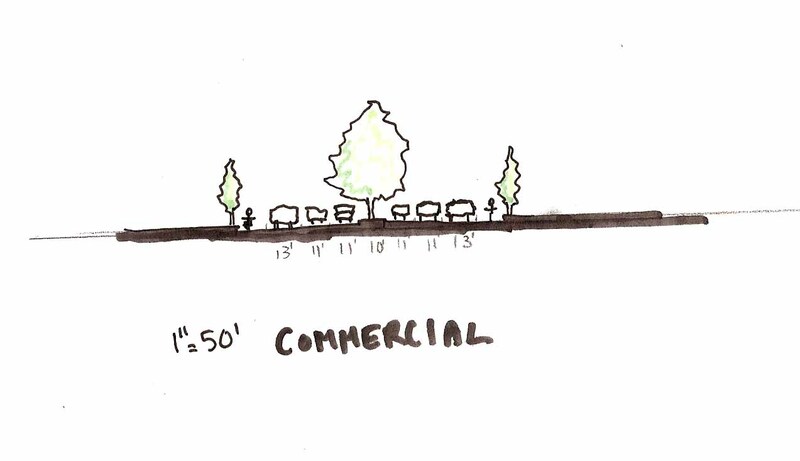 The above proposal details a new Commercial Street with 10′ sidewalks and 6′ dedicated bicycle commuterways on each side. 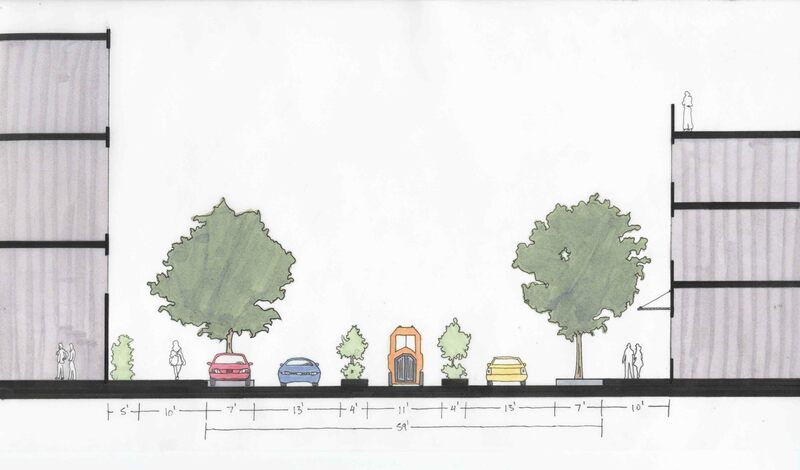 These renovations along with landscaped mediums between the bike paths and the street are intended to separate the pedestrians from the street and to create a more pedestrian-friendly atmosphere. 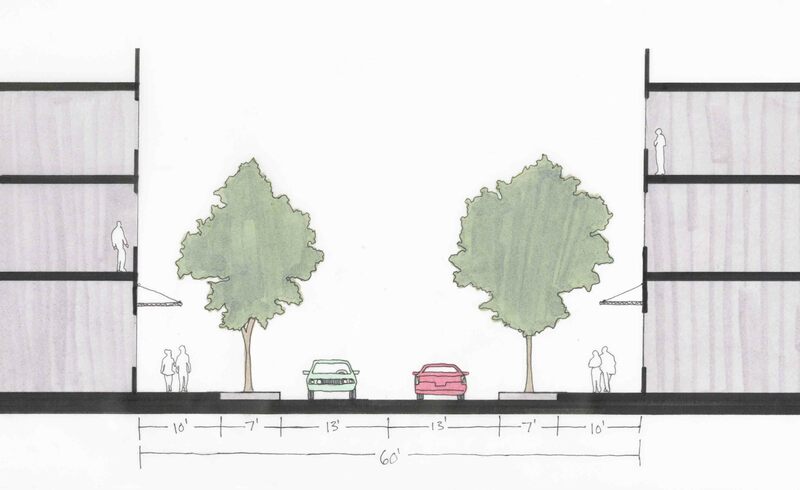 The Commercial Street renovation also has a new 16′, pedestrian-accessible medium with broad canopy trees. 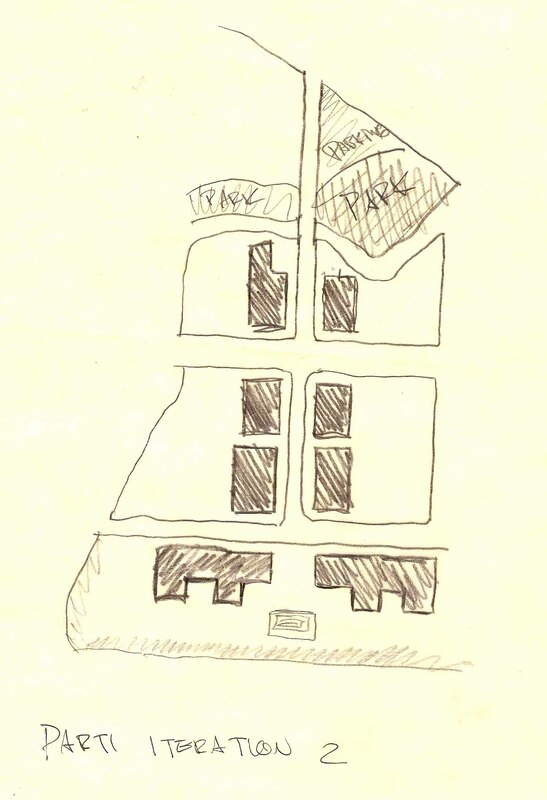 Front street, with its unique relationship to the railroad was another problem altogether. 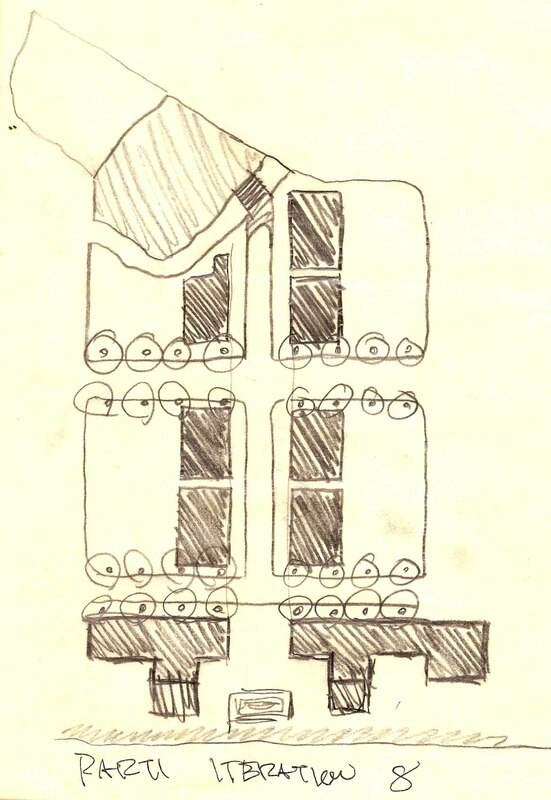 After input of the Oregon Department of Public Safety and Union Pacific (who own the rail line), the reasonable reality of being able to move the rail line seemed slim an the cost-prohibitive nature of intensive excavation made putting the railway above or below ground impractical. So, we resolved to make the best of the situational layout and planned for safeguards to make the railway be and seem less dangerous. 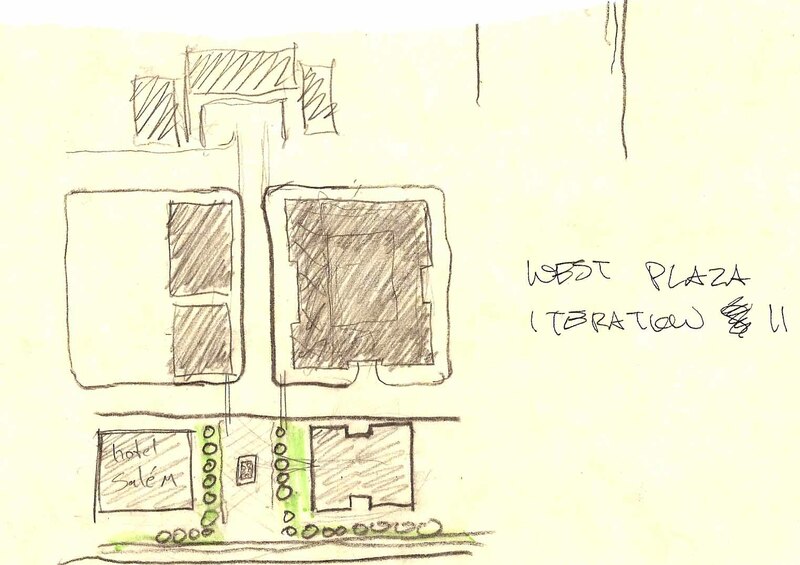 Along with adding side parking and trees to the sides of the street, Front Street was also updated with convenient lighted crosswalks and planting mediums between the railway and the streets surrounding it. 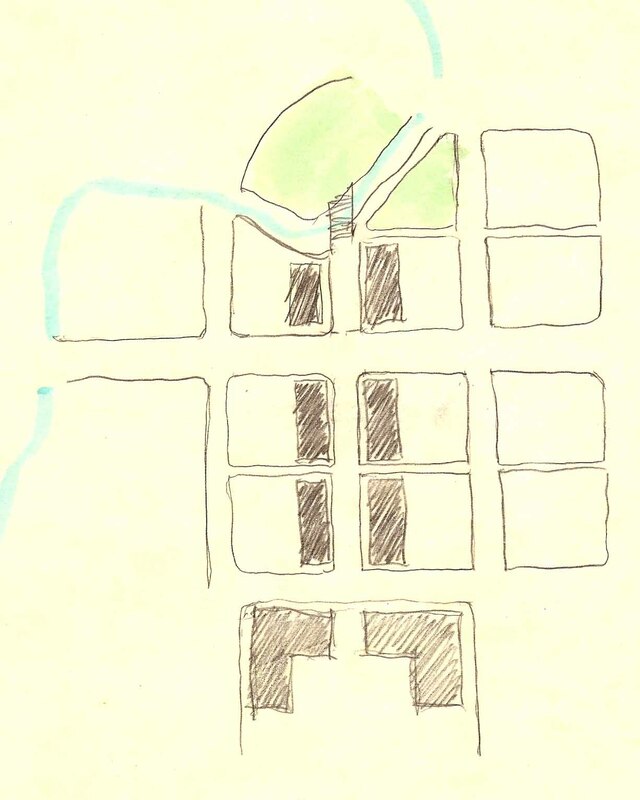 Fir Street, as the key axial-hub of this proposal, is kept simple. 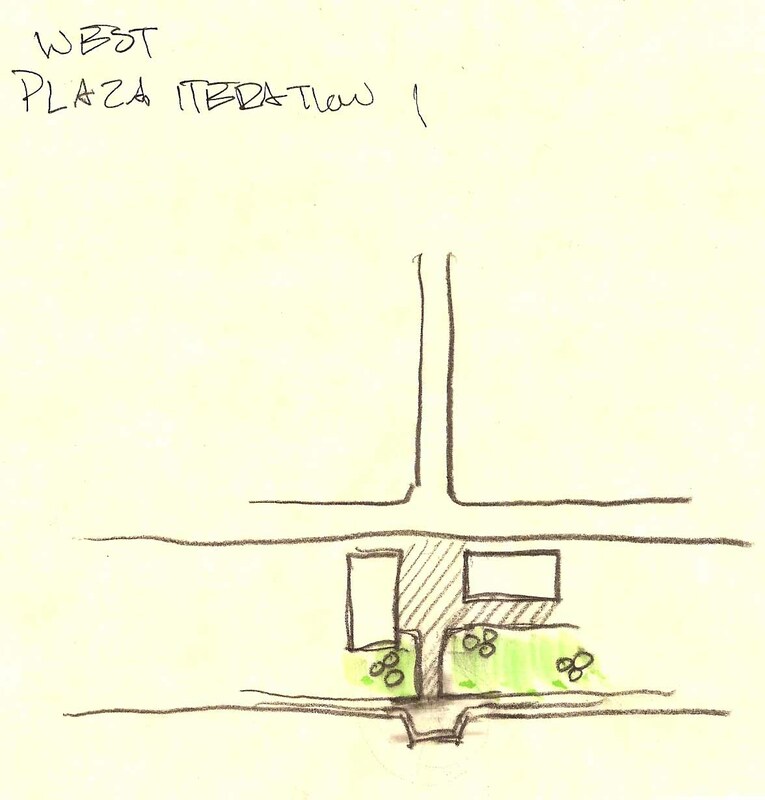 On-street parking, side trees and an expanded sidewalk are intended to enhance the pedestrian atmosphere of the block. 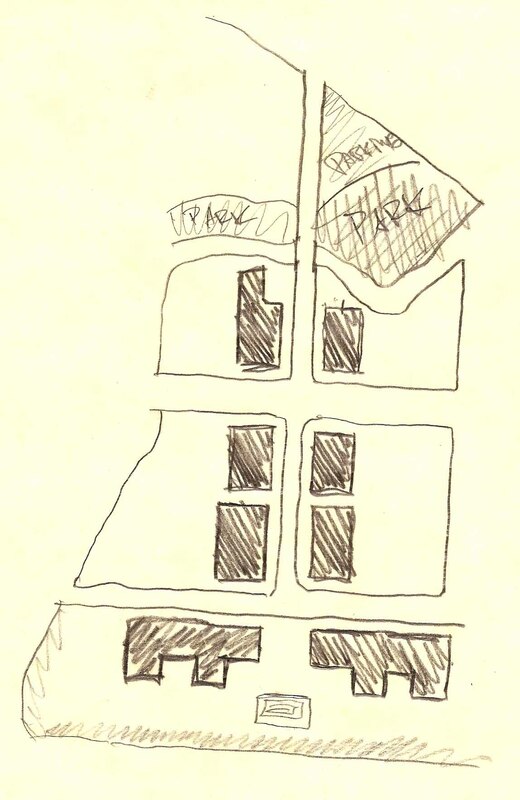 This street is zoned to have mixed-use buildings with residential units on the top and restaurants/retail/entertainment on the ground floor. 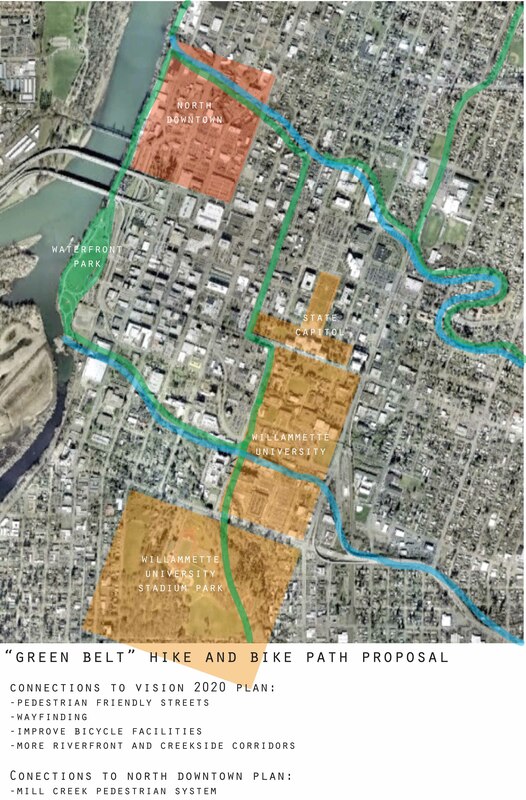 A major part of this project was the proposal of a “green corridor” greenbelt system surrounding and connecting the entire downtown area of Salem and connecting it axially to the major residential neighborhoods of the city, the state capitol and Willamette University. 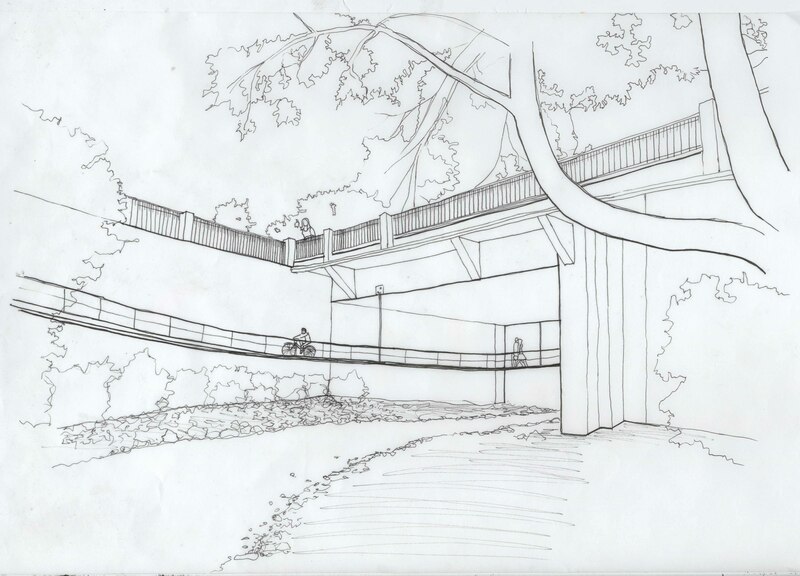 The city already has a rather attractive and well-developed hike and bike system along the East bank of the Willamette river running from the South end of downtown to just South of the new pedestrian bridge connecting our site to the West side of the river. 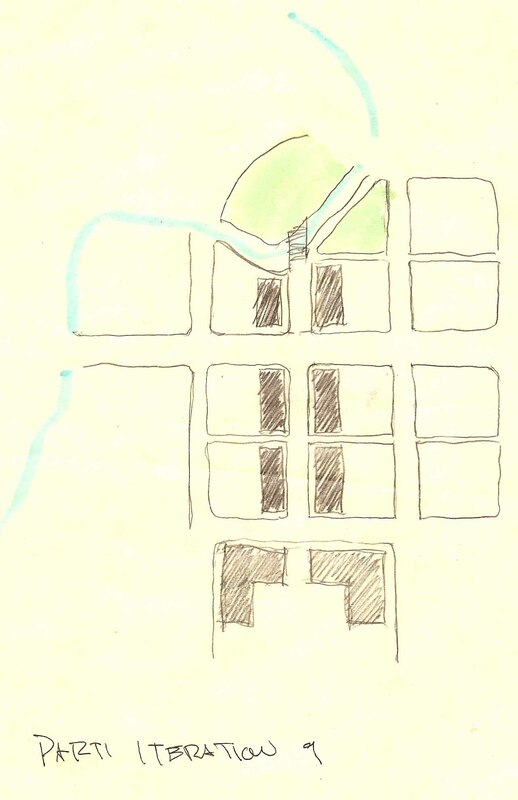 For this project, we proposed extending this system North through the sight up to the intersection of Mill Creek and the river (the North-East corner of downtown proper) and then running it East along the bank of the creek, the South along the East side of downtown (connecting the path to the state capitol complex and several points o interest on the Willamette University campus). 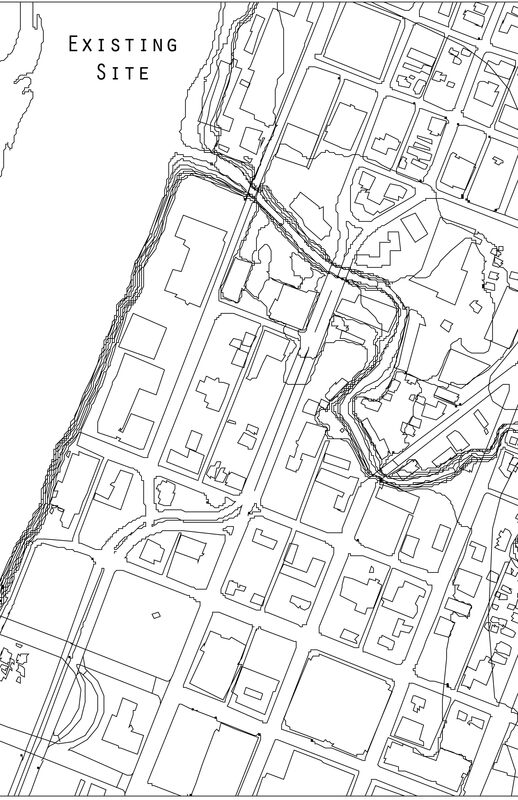 The path would then run West along the South end of downtown and connect to the currently-developed river path at the South-West corner of the city at the site of the beautiful “River Park”. 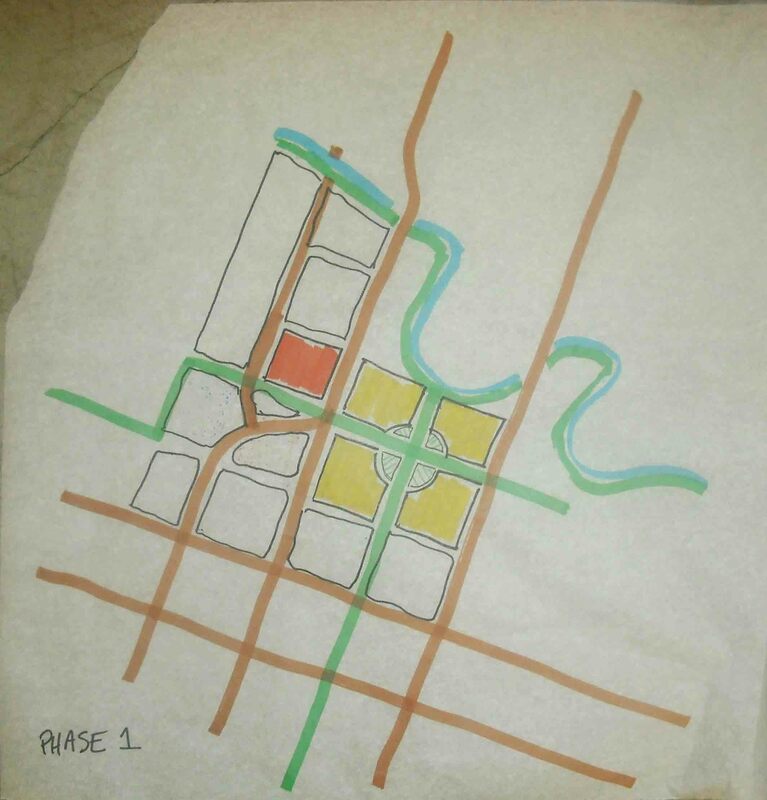 The greenway system was proposed in response to the city’s published declaration of wanting to increase pedestrian and bicycle commuting in the city. 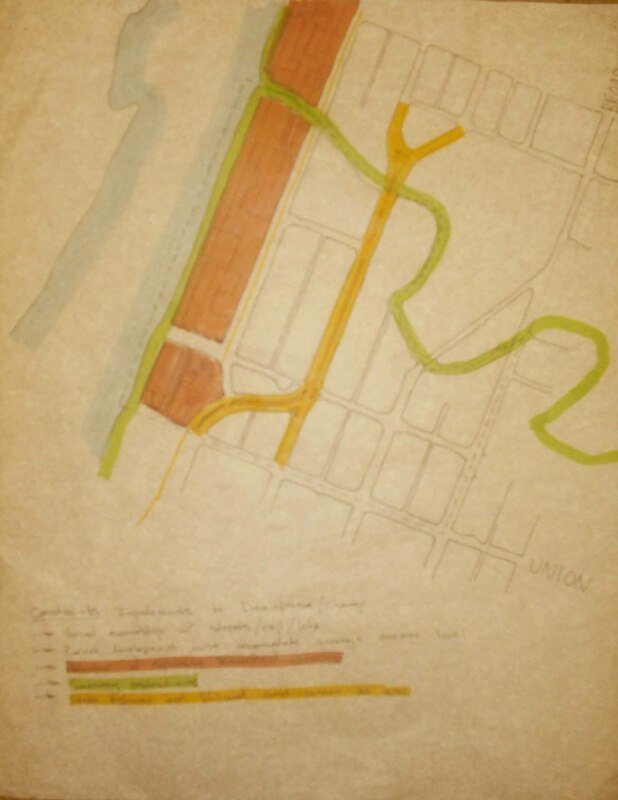 The small section of currently-developed greenway seemed like a great starting point for making the city’s desires a reality. 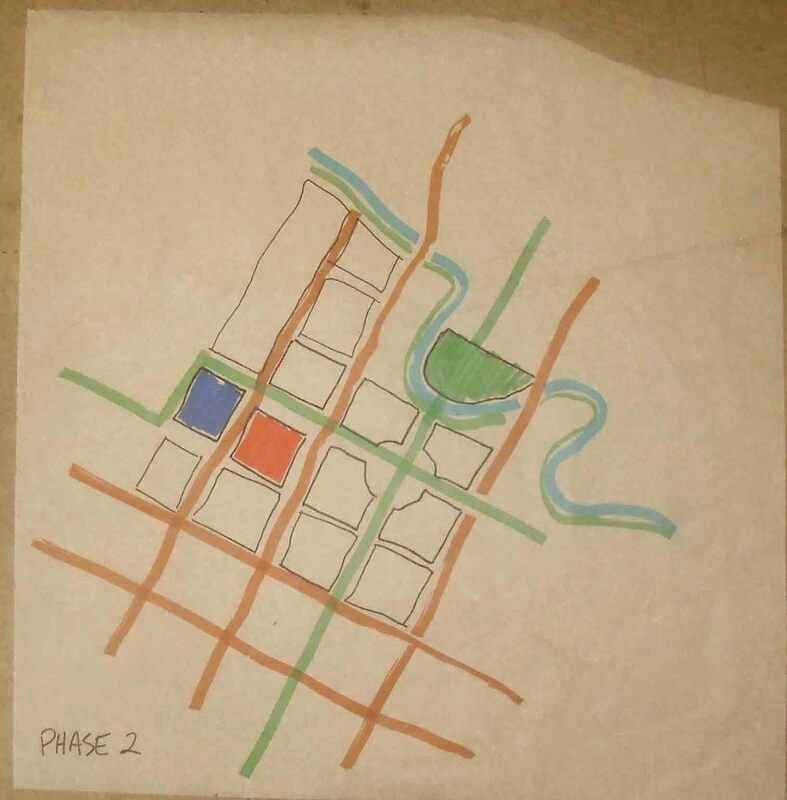 The Salem North Downtown redevelopment proposal was planned to be enacted in 3 phases. 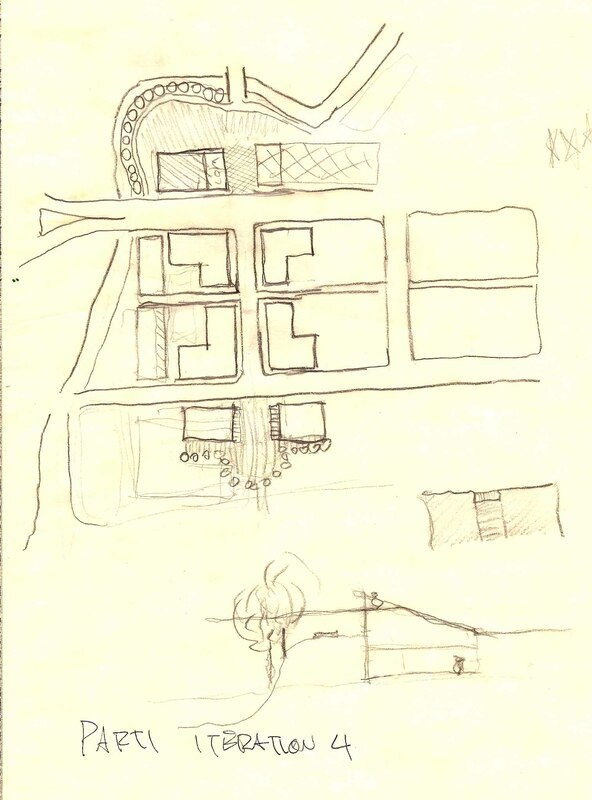 The image above shows the neighborhood as it currently exists. 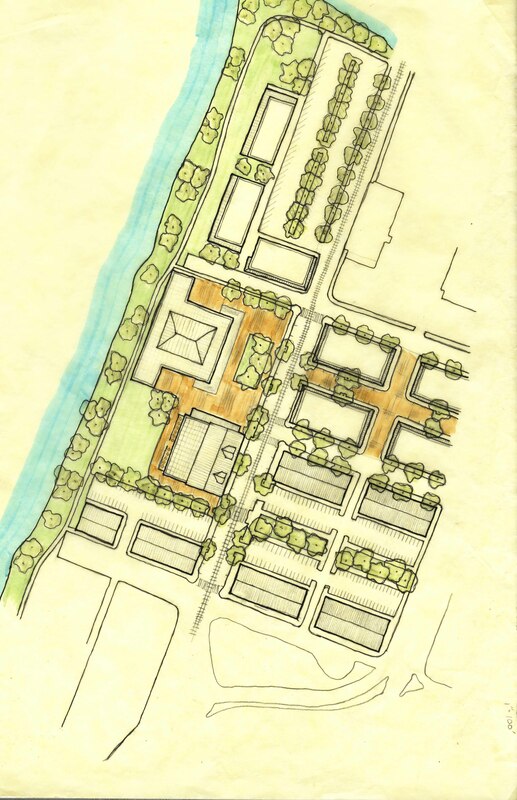 The first phase of the redevelopment plan involves the major development of the Fir Street commercial district and the two parks linking the Willamette River to Mill Creek.Phase 1 is anchored by the large civic amenity planned for the plaza. Phase 2 involves the development of mixed-demographic residential buildings along the major waterfront properties on the site. 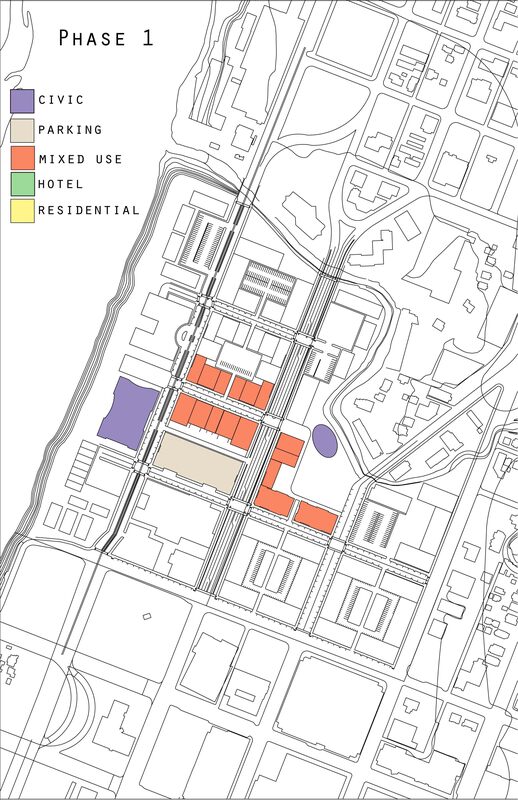 It also recommends the development of a major hotel on the North side of the New Town Center. 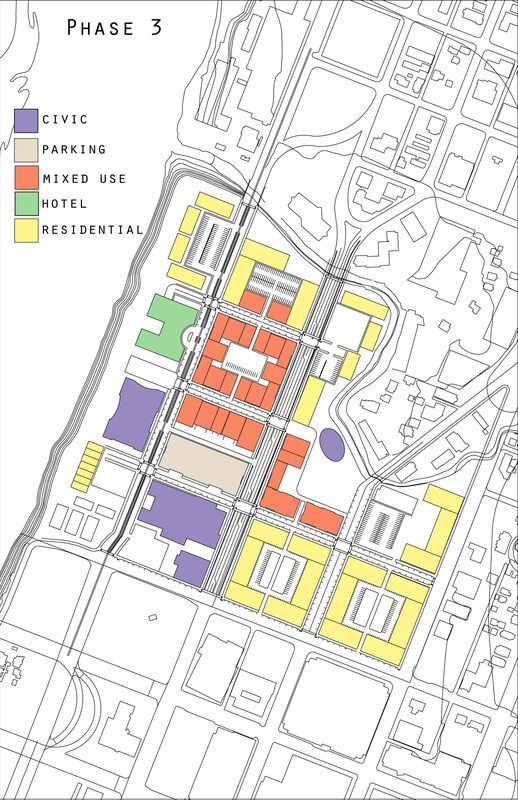 Phase 3 brings the plan into full swing with the addition of several mixed-income residential units on the South East corner of the site to serve the growing Willamette University student population and the growing general housing need. 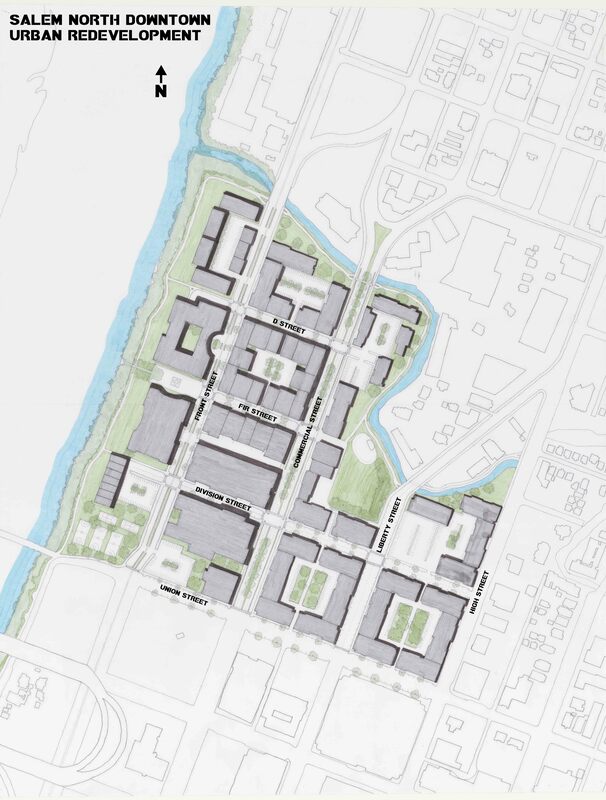 Phase 3 also includes a new YMCA athletic facility on the South West side of the site, directly adjacent to a large public park and the egress of the foot bridge that connects the site to the athletic parks on the other side of the river. 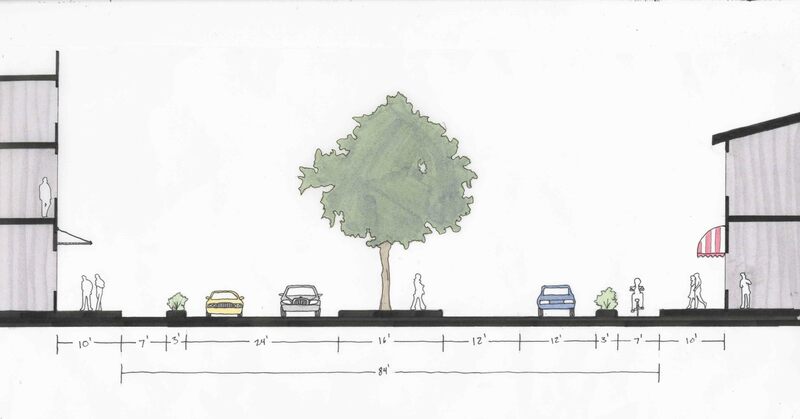 The rendering above shows one possible conception for how to have the greenway cross Front and Commercial streets. 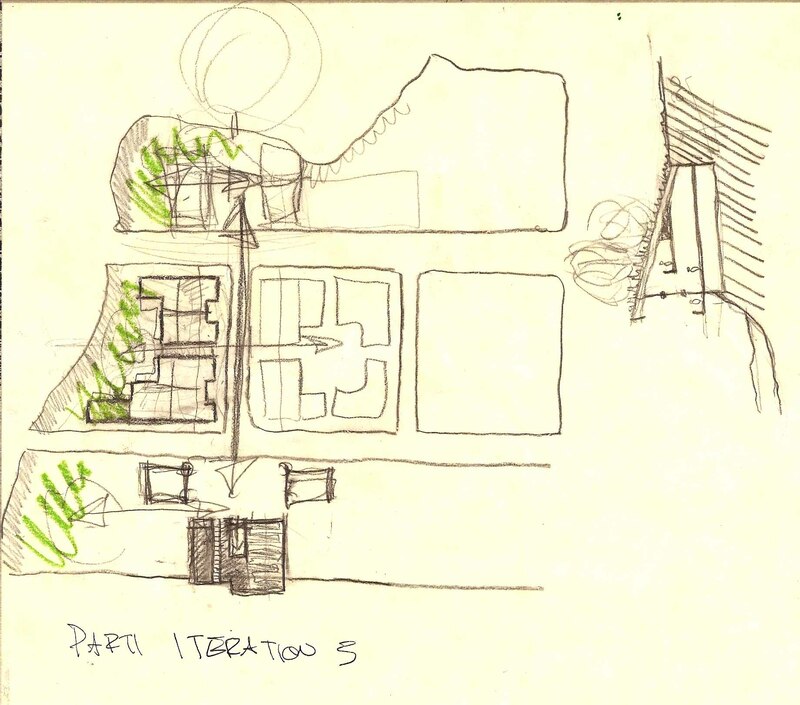 This rendering is an expansion of the Fir Street section presented above. 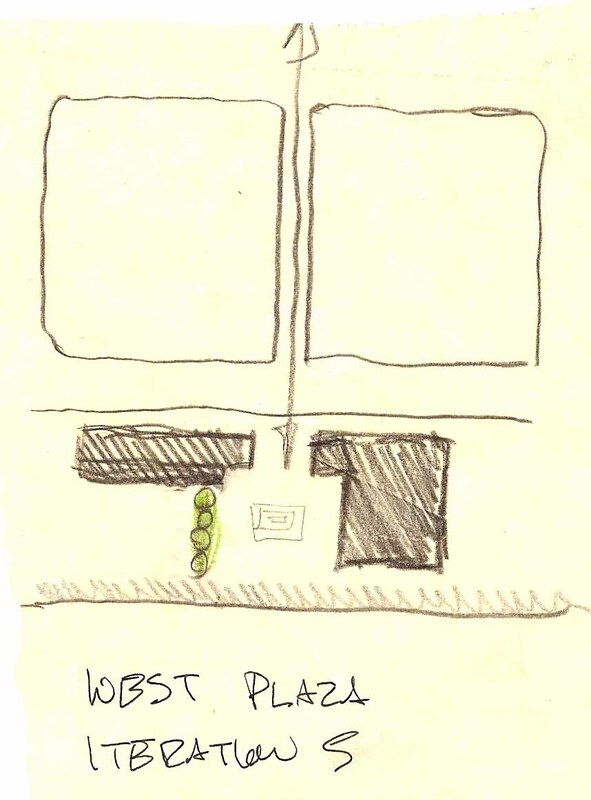 The rendering above is one idea for how the West-axial Willamette Plaza could look. 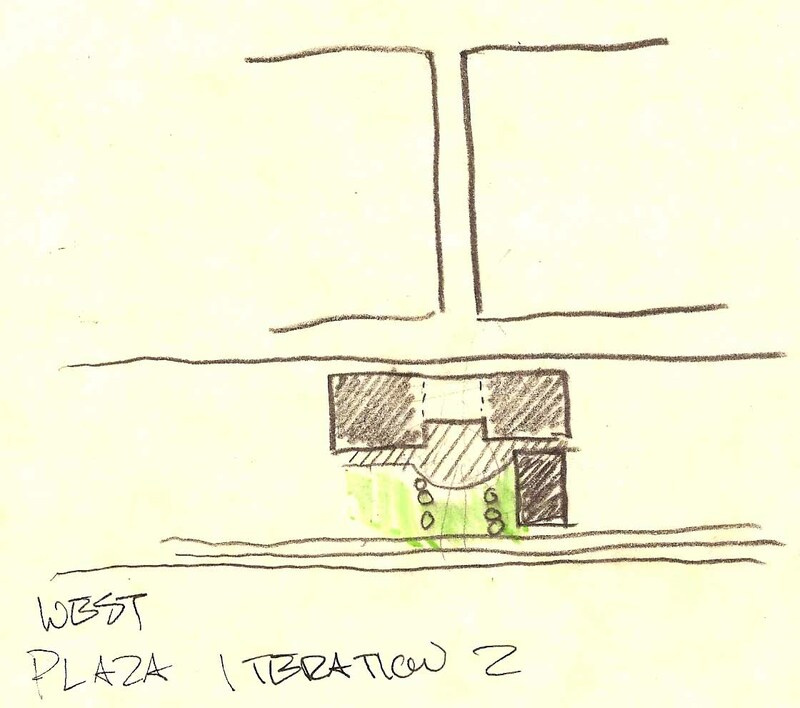 This proposal includes a large, occupiable central fountain, vending booths, and bike storage. 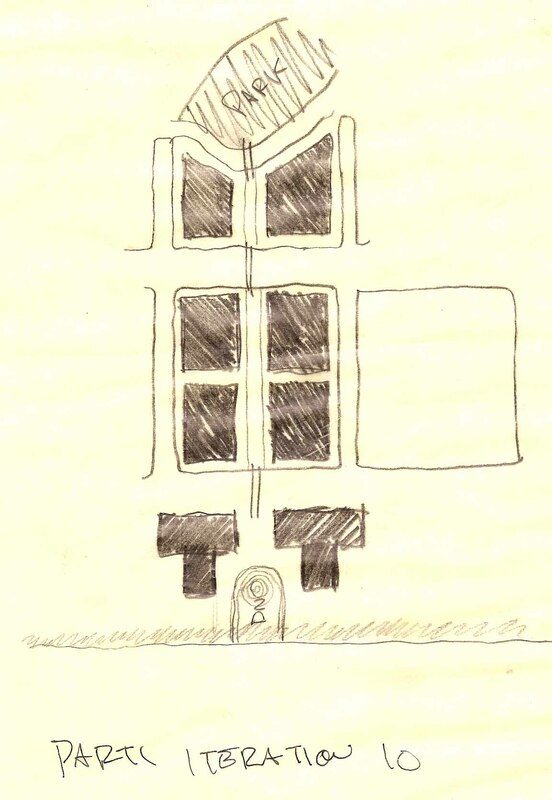 It is bordered on the North side by a mixed-use residential facility and on the South by a public civic building (possibly a library or museum). 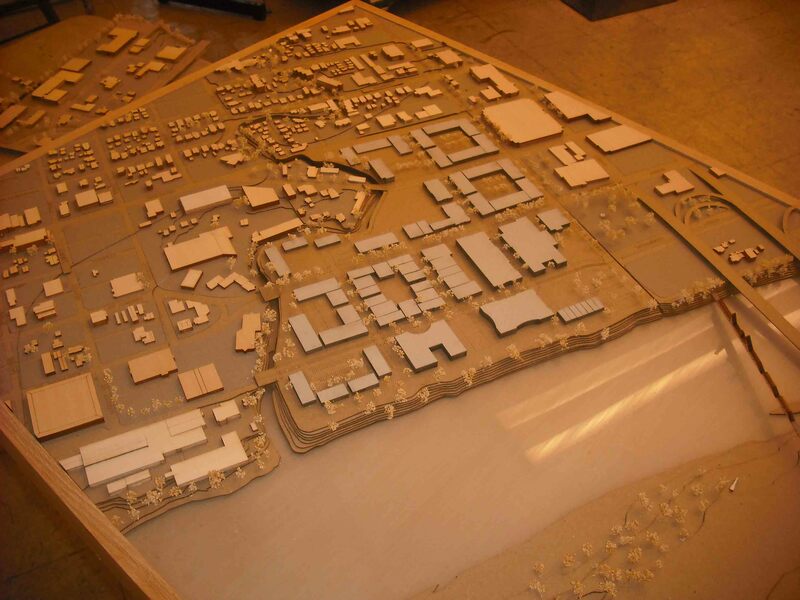 The class constructed a 1:200 scale site model of the whole Salem North Downtown neighborhood. 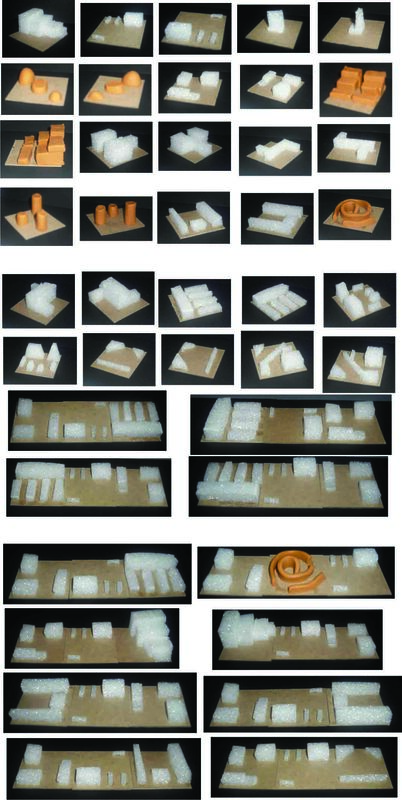 The model was constructed with large removable pieces so that individual project models could be placed into it. 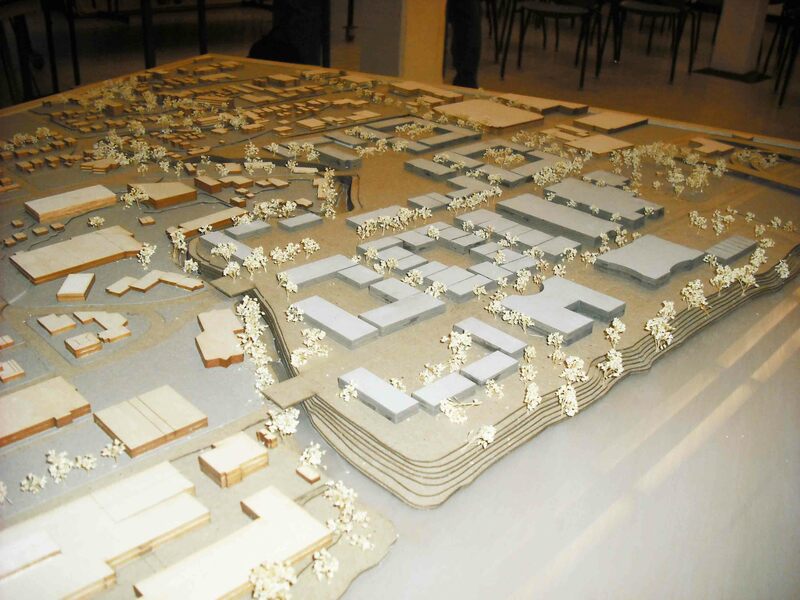 The gray portion of the model in the picture above is my 1:200 scale site model inlay. The Salem North Downtown redevelopment project was an exhausting labor. 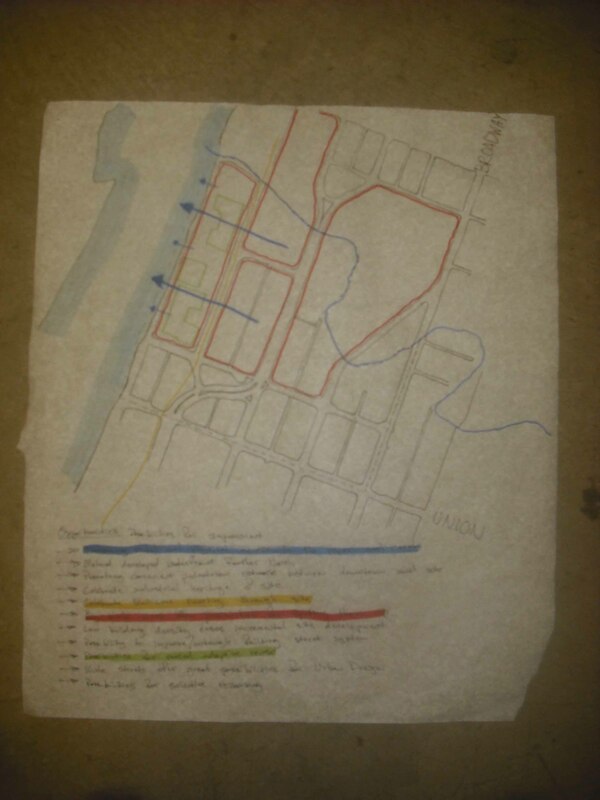 From the time we decided to do the project to the time we presented it to the city of Salem, only 4 weeks had elapsed. Many sleepless nights and weekends went into making this project possible. 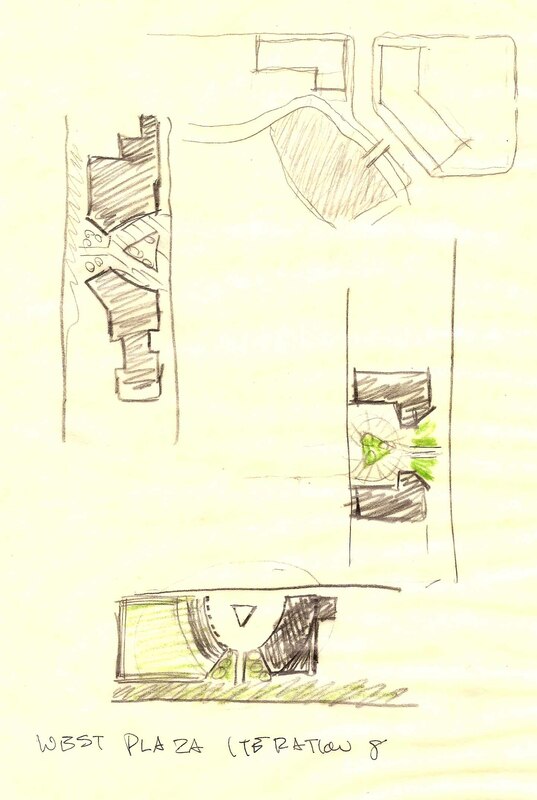 What will be shown below is a small snapshot of the work that went into the design development of this project. 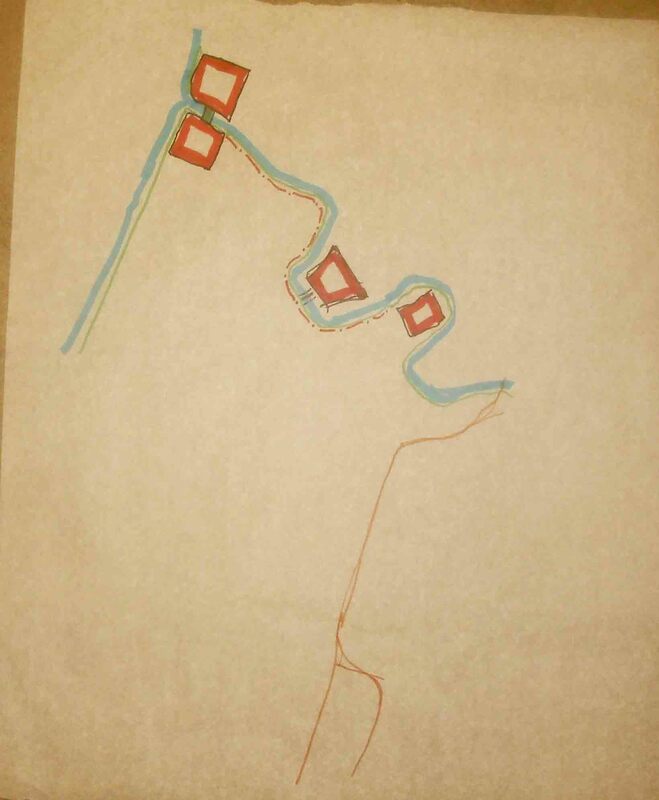 The following images are a series of study overlays done on trace paper over a map of the existing site. 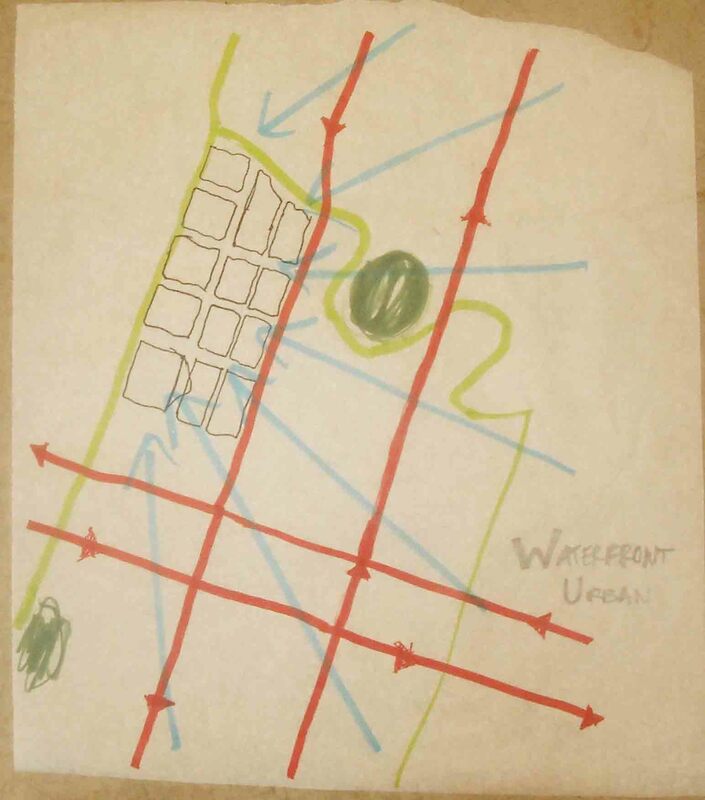 The overlay above is exploring the major transportational pathways of the sight (including the proposed greenway) and the desire to draw commercial traffic from the residential neighborhoods to the East, North and South. 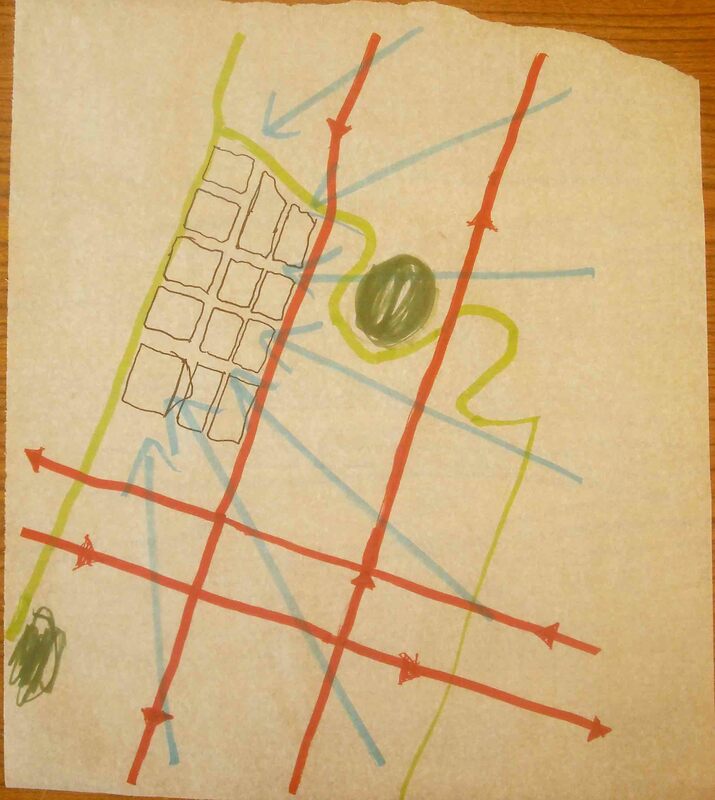 The above overlay is exploring possibilities for the proposed pedestrian/bicycle greenway in the neighborhood. 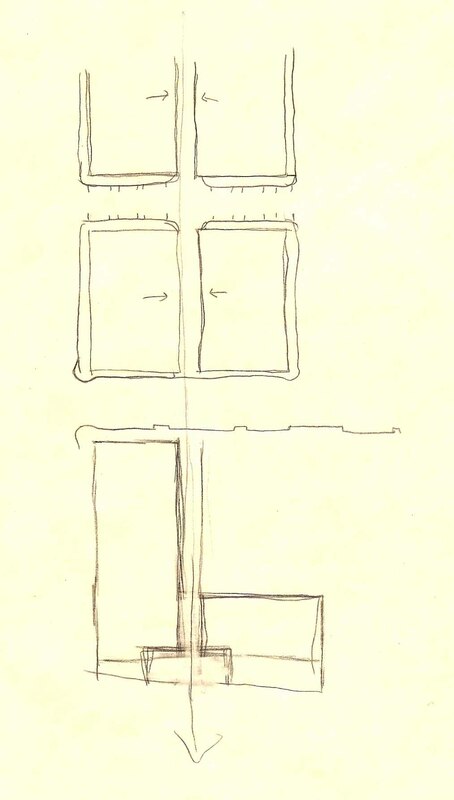 The following three diagrams are studies in the 3 stages of phasing for the project. 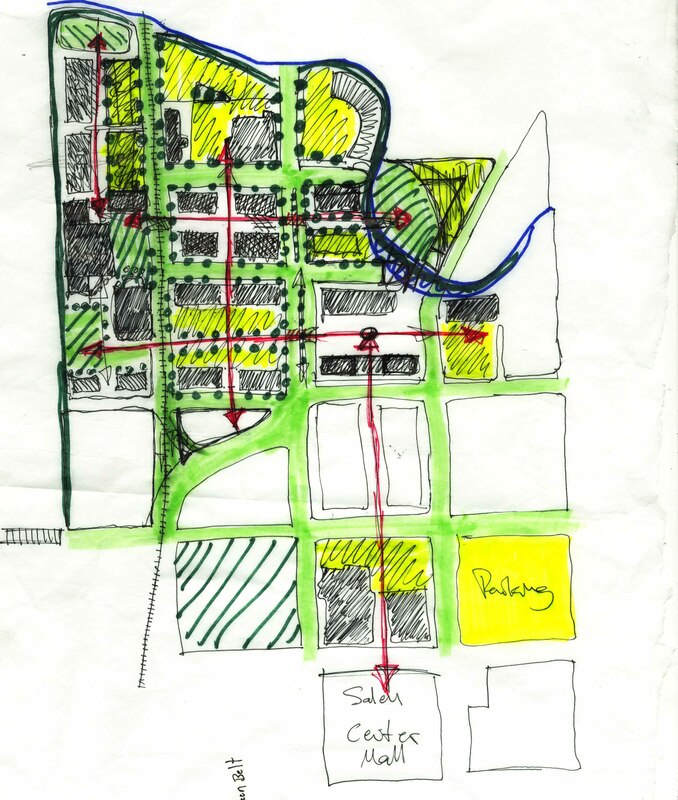 The diagram above is studding possibilities for park-space along Mill Creek in relation to other factors. 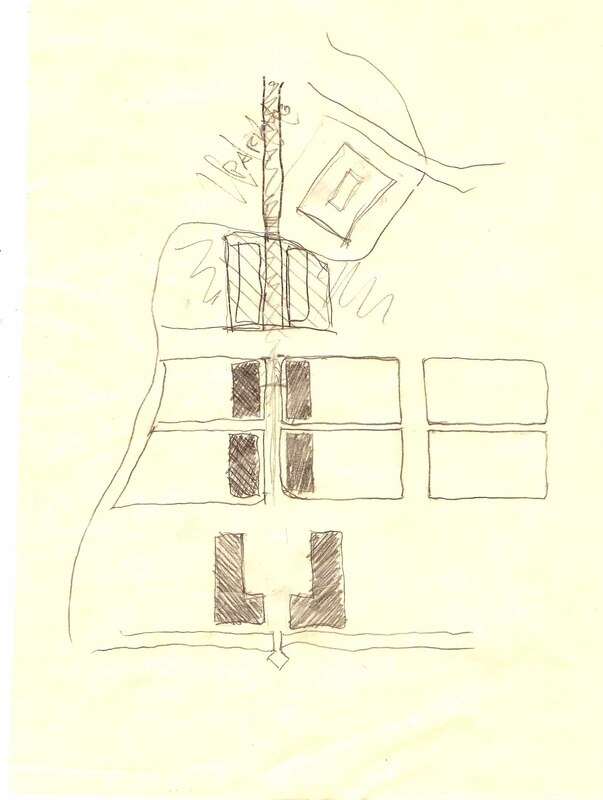 The diagram below is looking specifically at major points-of-interest along Mill Creek on the North side of the site. 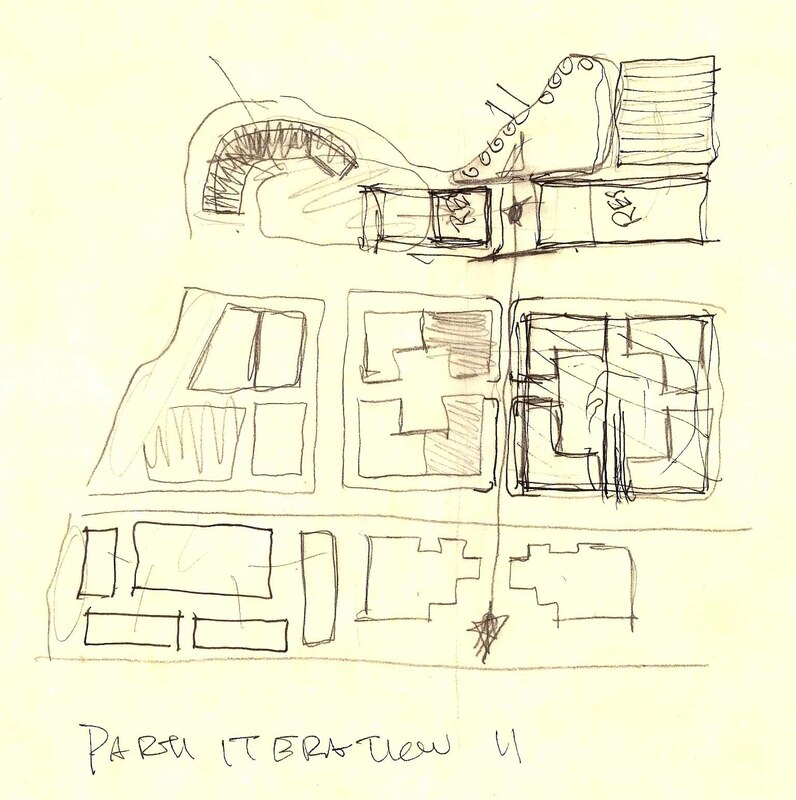 It explores possible locations for public parks and civic areas. 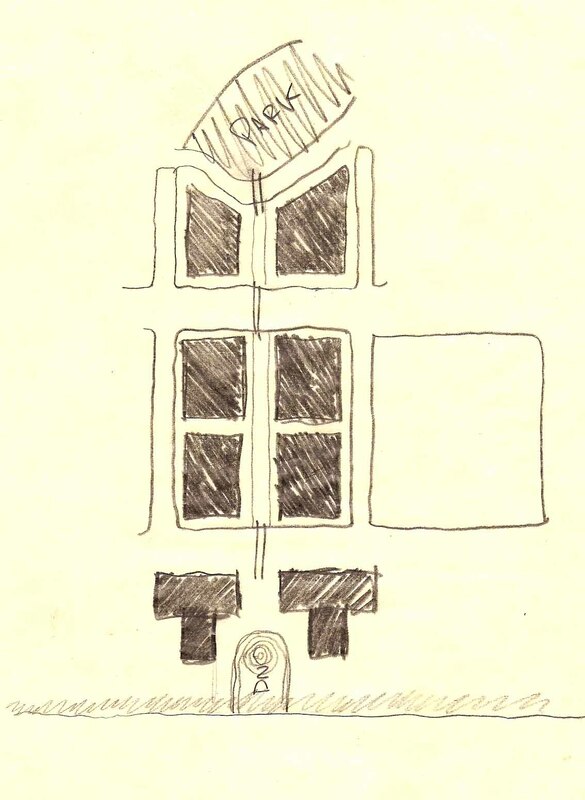 The diagram above is an early iteration of the SWOT analysis presented on the research page for this project. 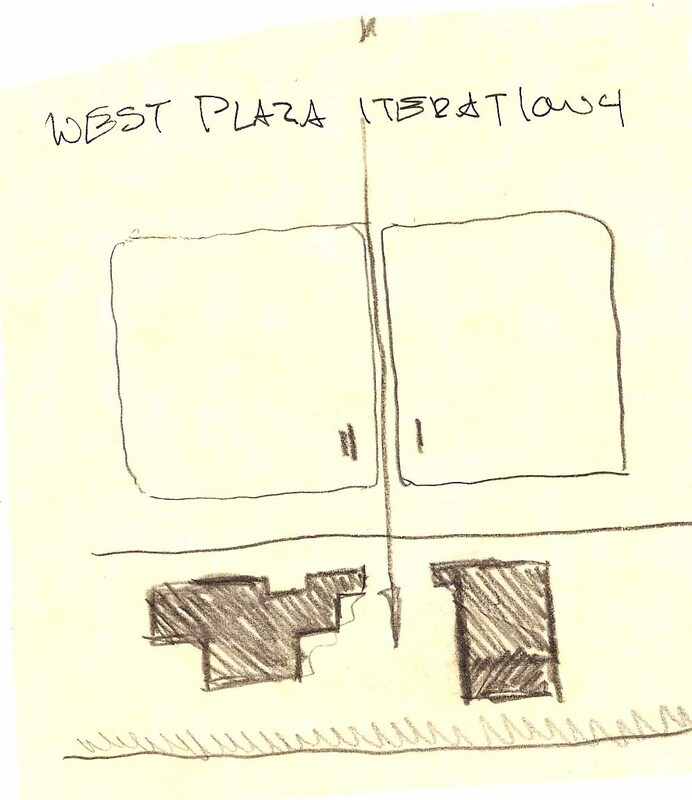 The diagram above is a turning-point schematic iteration of the whole project. 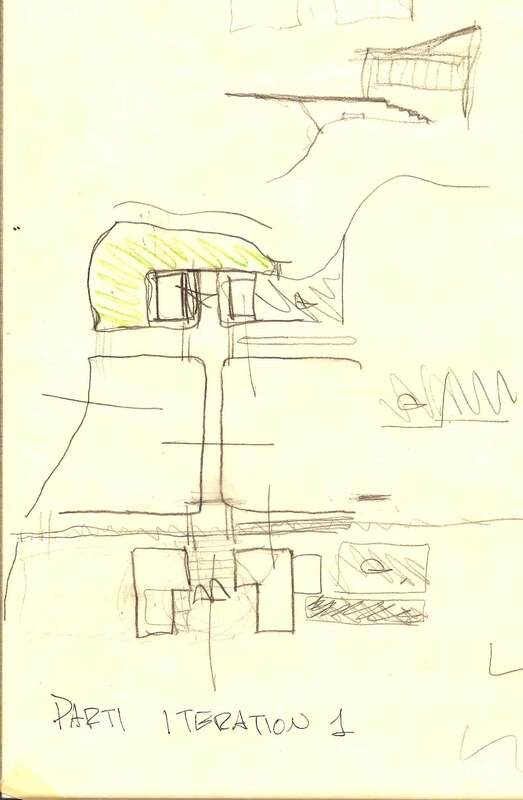 It represents basically the information that I presented at the midterm (the midterm drawings can be seen below). The diagrams above and below are another part of the early SWOT analysis. 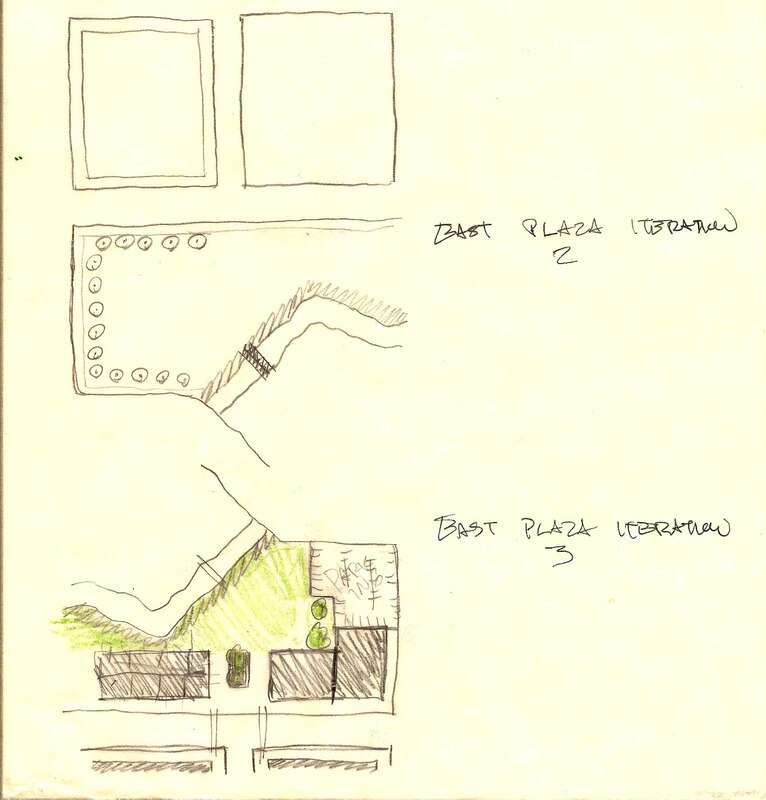 The following two sections were studies of how the neighborhood would relate to the river and creek. 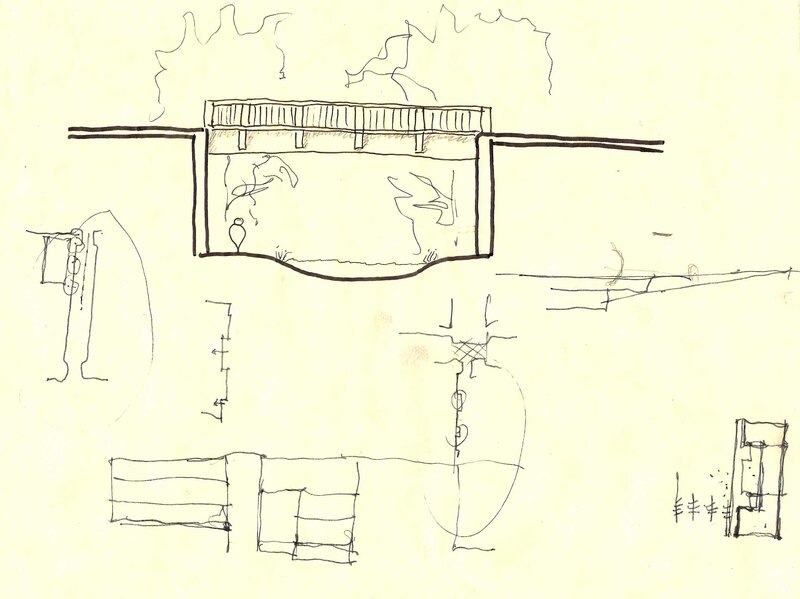 The image above is a hand-rendered plan showing the basic schematic proposal for the project at midterm. 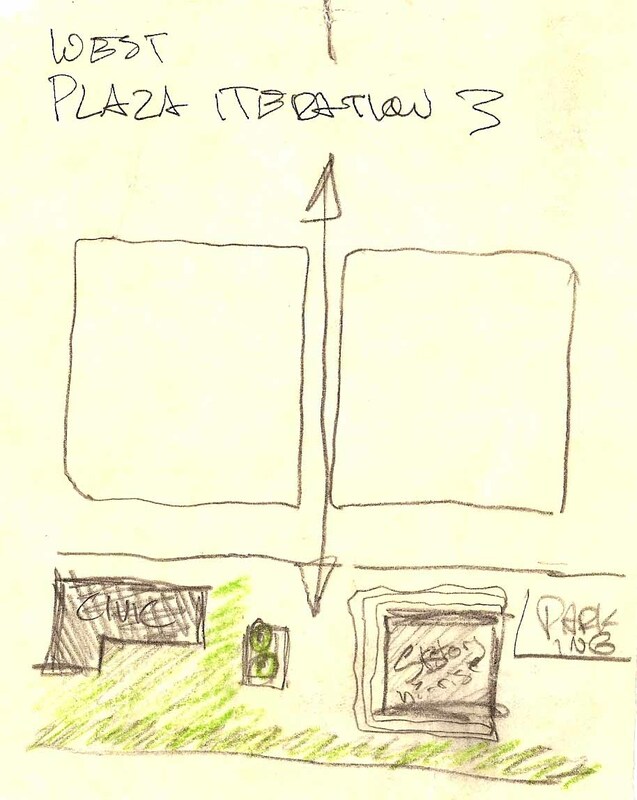 The image above is a large-scale plan showing the conception of “Willamette Plaza” and the major commercial axes as midterm time. 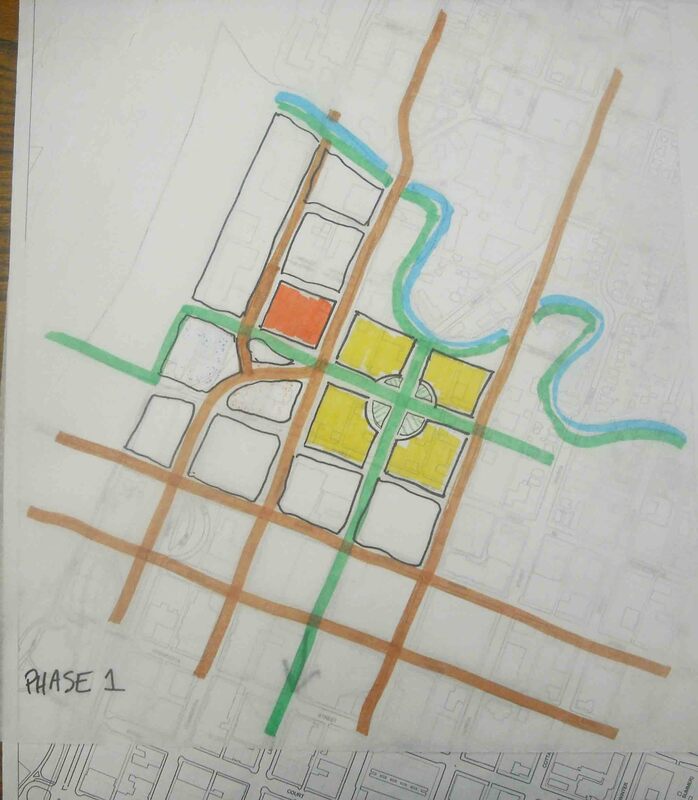 The following are a few of the study sections I did while thinking about ways to accomplish a pedestrian/bicycle crossing over/under/through Commercial and Front streets.